Pasta (Italian pronunciation: [ˈpasta]) is a staple food of Italian cuisine. Pasta is typically made from an unleavened dough of durum wheat flour mixed with water or eggs, and formed into sheets or various shapes, then cooked by boiling or baking. Rice flour, or legumes, such as beans or lentils are sometimes used in place of wheat flour to yield a different taste and texture, or as a gluten-free alternative. Pastas are divided into two broad categories: dried (pasta secca) and fresh (pasta fresca). Most dried pasta is produced commercially via an extrusion process, although it can be produced at home. Fresh pasta is traditionally produced by hand, sometimes with the aid of simple machines. Fresh pastas available in grocery stores are produced commercially by large-scale machines. As a category in Italian cuisine, both fresh and dried pastas are classically used in one of three kinds of prepared dishes: as pasta asciutta (or pastasciutta), cooked pasta is plated and served with a complementary side sauce or condiment; a second classification of pasta dishes is pasta in brodo, in which the pasta is part of a soup-type dish. A third category is pasta al forno, in which the pasta is incorporated into a dish that is subsequently baked in the oven. Pasta dishes are generally simple, but individual dishes vary in preparation. Some pasta dishes are served as a small first course or for light lunches, such as pasta salads. Other dishes may be portioned larger and used for dinner. Pasta sauces similarly may vary in taste, color and texture. In terms of nutrition, cooked plain pasta is 31% carbohydrates (mostly starch), 6% protein, and low in fat, with moderate amounts of manganese, but pasta generally has low micronutrient content. Pasta may be enriched or fortified, or made from whole grains. First attested in English in 1874, the word "pasta" comes from Italian pasta, in turn from Latin pasta, latinisation of the Greek παστά (pasta) "barley porridge". 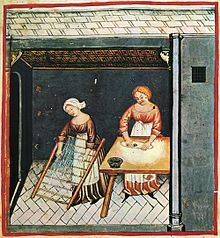 Making pasta; illustration from the 15th century edition of Tacuinum Sanitatis, a Latin translation of the Arabic work Taqwīm al-sihha by Ibn Butlan. In the 1st century AD writings of Horace, lagana (singular: laganum) were fine sheets of fried dough and were an everyday foodstuff. Writing in the 2nd century Athenaeus of Naucratis provides a recipe for lagana which he attributes to the 1st century Chrysippus of Tyana: sheets of dough made of wheat flour and the juice of crushed lettuce, then flavoured with spices and deep-fried in oil. An early 5th century cookbook describes a dish called lagana that consisted of layers of dough with meat stuffing, an ancestor of modern-day lasagna. However, the method of cooking these sheets of dough does not correspond to our modern definition of either a fresh or dry pasta product, which only had similar basic ingredients and perhaps the shape. The first concrete information concerning pasta products in Italy dates from the 13th or 14th century. West of Termini there is a delightful settlement called Trabia. Its ever-flowing streams propel a number of mills. Here there are huge buildings in the countryside where they make vast quantities of itriyya which is exported everywhere: to Calabria, to Muslim and Christian countries. Very many shiploads are sent. One form of itriyya with a long history is laganum (plural lagana), which in Latin refers to a thin sheet of dough, and gives rise to Italian lasagna. There is a legend of Marco Polo importing pasta from China which originated with the Macaroni Journal, published by an association of food industries with the goal of promoting pasta in the United States. Rustichello da Pisa writes in his Travels that Marco Polo described a food similar to "lagana". Jeffrey Steingarten asserts that Arabs introduced pasta in the Emirate of Sicily in the ninth century, mentioning also that traces of pasta have been found in ancient Greece and that Jane Grigson believed the Marco Polo story to have originated in the 1920s or 30s in an advertisement for a Canadian spaghetti company. In Greek mythology, it is believed that the god Hephaestus invented a device that made strings of dough. This was the earliest reference to a pasta maker. In the 14th and 15th centuries, dried pasta became popular for its easy storage. This allowed people to store pasta on ships when exploring the New World. A century later, pasta was present around the globe during the voyages of discovery. Although tomatoes were introduced to Italy in the 16th century and incorporated in Italian cuisine in the 17th century, description of the first Italian tomato sauces dates from the late 18th century: the first written record of pasta with tomato sauce can be found in the 1790 cookbook L'Apicio Moderno by Roman chef Francesco Leonardi. Before tomato sauce was introduced, pasta was eaten dry with the fingers; the liquid sauce demanded the use of a fork. At the beginning of the 17th century, Naples had rudimentary machines for producing pasta, later establishing the kneading machine and press, making pasta manufacturing cost-effective. In 1740, a license for the first pasta factory was issued in Venice. During the 1800s, water mills and stone grinders were used to separate semolina from the bran, initiating expansion of the pasta market. In 1859, Joseph Topits (1824−1876) founded the first pasta factory of Hungary in the city of Pest, which worked with steam machines; it was one of the first pasta factories of Central Europe. By 1867, Buitoni Company in Sansepolcro, Tuscany became an established pasta manufacturer. During the early 1900s, artificial drying and extrusion processes enabled greater variety of pasta preparation and larger volumes for export, beginning a period called "The Industry of Pasta". In 1884, the Zátka Brothers’s plant in Boršov nad Vltavou was founded and this was the first Pasta factory of Bohemia. Using tomato sauce to give pasta its flavour was revolutionary, since it was originally eaten plain. The consumption of pasta has changed over time; while once a small, simple item, it is now often eaten in much larger portions and as part of complex, sophisticated dishes. Factors such as low prices and ease of cooking contribute to the growing popularity of this staple item. The art of pasta making and the devotion to the food as a whole has evolved since pasta was first conceptualized. It is estimated that Italians eat over 60 pounds (27 kg) of pasta per person, per year, easily beating Americans, who eat about 20 pounds (9.1 kg) per person. Pasta is so beloved in Italy that individual consumption exceeds the average production of wheat of the country; thus Italy frequently imports wheat for pasta making. 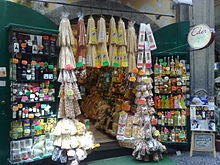 In contemporary society pasta is ubiquitous and individuals can find a variety of types in local supermarkets. With the worldwide demand for this staple food, pasta is now largely mass-produced in factories and only a tiny proportion is crafted by hand. Pasta was originally solely a part of Italian and European cuisine. With an increase in popularity on a worldwide scale, pasta has crossed international borders and is now a popular form of fast food and a staple in North America and elsewhere. This is due to the great amount of Italian immigration into Canada and the United States around the beginning of the 20th century. Similarly, an immense immigration of Italians into South Africa ensured that spaghetti with meatballs became an essential part of South African cuisine. Since at least the time of Cato's De Agri Cultura, basic pasta dough has been made mostly of wheat flour or semolina, with durum wheat used predominantly in the South of Italy and soft wheat in the North. Regionally other grains have been used, including those from barley, buckwheat, rye, rice, and maize, as well as chestnut and chickpea flours. To address needs of people affected by gluten-related disorders (such as coeliac disease, non-celiac gluten sensitivity and wheat allergy sufferers), some recipes use rice or maize for making pasta. Grain flours may also be supplemented with cooked potatoes. Other additions to the basic flour-liquid mixture may include vegetable purees such as spinach or tomato, mushrooms, cheeses, herbs, spices and other seasonings. While pastas are, most typically, made from unleavened doughs, the use of yeast-raised doughs are also known for at least nine different pasta forms. Additives in dried, commercially sold pasta include vitamins and minerals that are lost from the durum wheat endosperm during milling. They are added back to the semolina flour once it is ground. Micronutrients added may include niacin (vitamin B3), riboflavin (vitamin B2), folate, thiamine (vitamin B1), and ferrous iron. Fresh pasta is usually locally made with fresh ingredients unless it is destined to be shipped, in which case consideration is given to the spoilage rates of the desired ingredients such as eggs or herbs. Furthermore, fresh pasta is usually made with a mixture of eggs and all-purpose flour or “00” low-gluten flour. Since it contains eggs, it is more tender compared to dried pasta and only takes about half the time to cook. Delicate sauces are preferred for fresh pasta in order to let the pasta take front stage. Fresh pastas do not expand in size after cooking; therefore, 1.5 pounds (0.68 kg) of pasta are needed to serve four people generously. Fresh egg pasta is generally cut into strands of various widths and thicknesses depending on which pasta is to be made (e.g. fettuccine, pappardelle, and lasagne). It is best served with meat, cheese, or vegetables to create ravioli, tortellini, and cannelloni. Fresh egg pasta is well known in the Piedmont region and Emilia Romagna region in North Italy. In this area, dough is only made out of egg yolk and flour resulting in a very refined flavour and texture. This pasta is often served simply with butter sauce and thinly sliced truffles that are native to this region. In other areas, such as Apulia fresh pasta can be made without eggs. The only ingredients needed to make the pasta dough are semolina flour and water, which is often shaped into orecchiette or cavatelli. Fresh pasta for cavatelli is also popular in other places including Sicily. However, the dough is prepared differently: it is made of flour and ricotta cheese instead. Dried pasta can also be defined as factory-made pasta because it is usually produced in large amounts that require large machines with superior processing capabilities to manufacture. Dried pasta is mainly shipped over to farther locations and has a longer shelf life. The ingredients required to make dried pasta include semolina flour and water. Eggs can be added for flavour and richness, but are not needed to make dried pasta. In contrast to fresh pasta, dried pasta needs to be dried at a low temperature for several days to evaporate all the moisture allowing it to be stored for a longer period. Dried pastas are best served in hearty dishes like ragu sauces, soups, and casseroles. Once it is cooked, the dried pasta will usually grow to twice its original size. Therefore, approximately 1 pound (0.45 kg) of dried pasta serves up to four people. Pasta is generally served with some type of sauce; the sauce and the type of pasta are usually matched based on consistency and ease of eating. Northern Italian cooking uses less tomato sauce, garlic and herbs, and white sauce is more common. However Italian cuisine is best identified by individual regions. Pasta dishes with lighter use of tomato are found in Trentino-Alto Adige and Emilia Romagna. In Bologna, the meat-based Bolognese sauce incorporates a small amount of tomato concentrate and a green sauce called pesto originates from Genoa. In Central Italy, there are sauces such as tomato sauce, amatriciana, arrabbiata and the egg-based carbonara. Tomato sauces are also present in Southern Italian cuisine, where they originated. In Southern Italy more complex variations include pasta paired with fresh vegetables, olives, capers or seafood. Varieties include puttanesca, pasta alla norma (tomatoes, eggplant and fresh or baked cheese), pasta con le sarde (fresh sardines, pine nuts, fennel and olive oil), spaghetti aglio, olio e peperoncino (literally with garlic, [olive] oil and hot chili peppers). Ingredients to make pasta dough include semolina flour, egg, salt and water. Flour is first mounded on a flat surface and then a well in the pile of flour is created. Egg is then poured into the well and a fork is used to mix the egg and flour. There are a variety of ways to shape the sheets of pasta depending on the type required. The most popular types include penne, spaghetti, and macaroni. Kitchen pasta machines, also called pasta makers, are popular with cooks who make large amounts of fresh pasta. The cook feeds sheets of pasta dough into the machine by hand, and by turning a hand crank, rolls the pasta to thin it incrementally. On the final pass through the pasta machine, the pasta may be directed through a machine 'comb' to shape the pasta noodles as they emerge. Semolina flour consists of a protein matrix with entrapped starch granules. Upon the addition of water, during mixing, intermolecular forces allow the protein to form a more ordered structure in preparation for cooking. Durum wheat is ground into semolina flour which is sorted by optical scanners and cleaned. Pipes allow the flour to move to a mixing machine where it is mixed with warm water by rotating blades. When the mixture is of a lumpy consistency, the mixture is pressed into sheets or extruded. 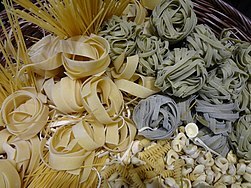 Varieties of pasta such as spaghetti and linguine are cut by rotating blades while pasta such as penne and rotini are extruded. The size and shape of the dies in the extruder through which the pasta is pushed determine the shape that results. The pasta is then dried at a high temperature. The ingredients to make dried pasta usually include water and semolina flour; egg for colour and richness (in some types of pasta), and possibly vegetable juice (such as spinach, beet, tomato, carrot), herbs or spices for colour and flavour. After mixing semolina flour with warm water the dough is kneaded mechanically until it becomes firm and dry. If pasta is to be flavoured, eggs, vegetable juices, and herbs are added at this stage. The dough is then passed into the laminator to be flattened into sheets, then compressed by a vacuum mixer-machine to clear out air bubbles and excess water from the dough until the moisture content is reduced to 12%. Next, the dough is processed in a steamer to kill any bacteria it may contain. The dough is then ready to be shaped into different types of pasta. Depending on the type of pasta to be made, the dough can either be cut or extruded through dies. The pasta is set in a drying tank under specific conditions of heat, moisture, and time depending on the type of pasta. The dried pasta is then packaged: Fresh pasta is sealed in a clear, airtight plastic container with a mixture of carbon dioxide and nitrogen that inhibits microbial growth and prolongs the product's shelf life; dried pastas are sealed in clear plastic or cardboard packages. Gluten, the protein found in grains such as wheat, rye, spelt, and barley, contributes to protein aggregation and firm texture of a normally cooked pasta. Gluten-free pasta is produced with wheat flour substitutes, such as vegetable powders, rice, corn, quinoa, amaranth, oats and buckwheat flours. Other possible gluten-free pasta ingredients may include hydrocolloids to improve cooking pasta with high heat resistance, xanthan gum to retain moisture during storage, or hydrothermally-treated polysaccharide mixtures to produce textures similar to those of wheat pasta. The storage of pasta depends its processing and extent of drying. Uncooked pasta is kept dry and can sit in the cupboard for a year if airtight and stored in a cool, dry area. Cooked pasta is stored in the refrigerator for a maximum of five days in an airtight container. Adding a couple teaspoons of oil helps keep the food from sticking to itself and the container. Cooked pasta may be frozen for up to two or three months. Should the pasta be dried completely, it can be placed back in the cupboard. Pasta exhibits a random molecular order rather than a crystalline structure. 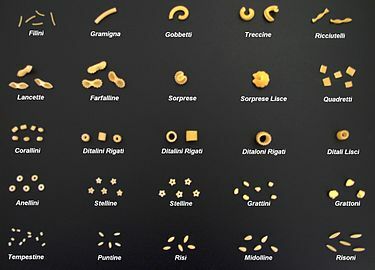 The moisture content of dried pasta is typically around 12%, indicating that dried pasta will remain a brittle solid until it is cooked and becomes malleable. The cooked product is, as a result, softer, more flexible, and chewy. Semolina flour is the ground endosperm of durum wheat, producing granules that absorb water during heating and an increase in viscosity due to semi-reordering of starch molecules. Another major component of durum wheat is protein which plays a large role in pasta dough rheology. Gluten proteins, which include monomeric gliadins and polymeric glutenin, make up the major protein component of durum wheat (about 75–80%). As more water is added and shear stress is applied, gluten proteins take on an elastic characteristic and begin to form strands and sheets. The gluten matrix that results during forming of the dough becomes irreversibly associated during drying as the moisture content is lowered to form the dried pasta product. Before the mixing process takes place, semolina particles are irregularly shaped and present in different sizes. Semolina particles become hydrated during mixing. The amount of water added to the semolina is determined based on the initial moisture content of the flour and the desired shape of the pasta. The desired moisture content of the dough is around 32% wet basis and will vary depending on the shape of pasta being produced. The forming process involves the dough entering an extruder in which the rotation of a single or double screw system pushes the dough toward a die set to a specific shape. As the starch granules swell slightly in the presence of water and a low amount of thermal energy, they become embedded within the protein matrix and align along the direction of the shear caused by the extrusion process. Starch gelatinization and protein coagulation are the major changes that take place when pasta is cooked in boiling water. Protein and starch competing for water within the pasta cause a constant change in structure as the pasta cooks. In 2011, the three largest producers of dried pasta were Italy (3.2 million tonnes), the United States (3 million tonnes), and Brazil (1.3 million tonnes). By 2016, Italy was still the largest producer of pasta in the world (3.4 million tonnes), followed by United States (2 million tonnes) and 3 countries in the one million tonnes range: Brazil, Turkey, and Russia. The largest per capita consumers of pasta in 2015 were Italy (23.5 kg/person), Tunisia (16.0 kg/person), Venezuela (12.0 kg/person) and Greece (11.2 kg/person). Nationally, the United States is the largest consumer of pasta with 2.7 million tons consumed in 2017. In the European Union, total pasta sales in 2008 were US $8.361 billion, of which $5.722 billion was for dried pasta, $2.244 billion was for fresh or chilled pasta, and $395 million was for canned or preserved pasta. In 2009, retail sales of pasta represented a $2.8 billion market in Italy, $1.4 billion in Germany, and $1.2 billion in France. In 2016, Italy was the world's largest exporter of pasta, with $2.8 billion sold, followed by China with $1.1 billion. The United States was the largest importer of pasta in 2016, with $1 billion acquired, followed by Germany and the UK. When cooked, plain pasta is composed of 62% water, 31% carbohydrates (26% starch), 6% protein, and 1% fat. A 100 gram portion of unenriched cooked pasta provides 160 Calories and a moderate level of manganese (15% of the Daily Value), but few other micronutrients. Pasta has a lower glycemic index than many other staple foods in Western culture, like bread, potatoes, and rice. As pasta was introduced elsewhere in the world, it became incorporated into a number of local cuisines, which often have significantly different ways of preparation from those of Italy. In Hong Kong, the local Chinese have adopted pasta, primarily spaghetti and macaroni, as an ingredient in the Hong Kong-style Western cuisine. When pasta was introduced to several nations, every culture adopted different style of preparing it. In the past, ancient Romans cooked pastas by frying or boiling it. It was also sweetened with honey or tossed with garum. Ancient Romans also enjoyed baking it in rich pies, called timballi. In Cha chaan teng, macaroni is cooked in water and served in broth with ham or frankfurter sausages, peas, black mushrooms, and optionally eggs, reminiscent of noodle soup dishes. This is often a course for breakfast or light lunch fare. These affordable dining shops evolved from American food rations after World War II due to lack of supplies, and they continue to be popular for people with modest means. Two common spaghetti dishes served in Japan are the Bolognese and the Napolitan. In Nepal, macaroni has been adopted and cooked in a Nepalese way. Boiled macaroni is sautéed along with cumin, turmeric, finely chopped green chillies, onions and cabbage. In Greece hilopittes is considered one of the finest types of dried egg pasta. It is cooked either in tomato sauce or with various kinds of casserole meat. It is usually served with Greek cheese of any type. Pasta is also widespread in the Southern Cone, as well most of the rest of Brazil, mostly pervasive in the areas with mild to strong Italian roots, such as Central Argentina, and the eight southernmost Brazilian states (where macaroni are called macarrão, and more general pasta is under the umbrella term massa, literally "dough", together with some Japanese noodles, such as bifum rice vermicelli and yakisoba, which also entered general taste). The local names for the pasta are many times varieties of the Italian names, such as ñoquis/nhoque for gnocchi, ravioles/ravióli for ravioli, or tallarines/talharim for tagliatelle, although some of the most popular pasta in Brazil, such as the parafuso ("screw", "bolt"), a specialty of the country's pasta salads, are also way different both in name and format from its closest Italian relatives, in this case the fusilli. In Sweden, spaghetti is traditionally served with köttfärssås (Bolognese sauce), which is minced meat in a thick tomato soup. In the Philippines, spaghetti is often served with a distinct, slightly sweet yet flavourful meat sauce (the base of which would be tomato sauce or paste and ketchup), frequently containing ground beef or pork and diced hot dogs and ham. It is spiced with some soy sauce, heavy quantities of garlic, dried oregano sprigs and sometimes with dried bay leaf, and afterwards topped with grated cheese. Other pasta dishes are also cooked nowadays in the Filipino kitchen, like carbonara, pasta with alfredo sauce, and baked macaroni. These dishes are usually cooked for gatherings and special occasions, like family reunions or Christmas. Macaroni or other tube pasta is also used in sopas, a local chicken broth soup. Fettuccine alfredo with cream, cheese and butter, and spaghetti with tomato sauce (with or without meat) are popular Italian-style dishes in the United States. In Australia, boscaiola sauce, based on bacon and mushrooms, is one favorite among many. Pasta, or dried pasta with three subcategories – (i.) Durum wheat semolina pasta (pasta di semola di grano duro), (ii.) Low grade durum wheat semolina pasta (pasta di semolato di grano duro) and (iii.) Durum wheat whole meal pasta (pasta di semola integrale di grano duro). Pastas made under this category must be made only with durum wheat semolina or durum wheat whole-meal semolina and water, with an allowance for up to 3% of soft-wheat flour as part of the durum flour. Dried pastas made under this category must be labeled according to the subcategory. Special pastas (paste speciali) – As Pasta above, with additional ingredients other than flour and water or eggs. Special pastas must be labeled as durum wheat semolina pasta on the packaging completed by mentioning the added ingredients used (e.g., spinach). The 3% soft flour limitation still applies. Egg pasta (pasta all'uovo) – May only be manufactured using durum wheat semolina with at least 4 hens’ eggs (chicken) weighing at least 200 grams (without the shells) per kilogram of semolina, or a liquid egg product produced only with hen’s eggs. Pasta made and sold in Italy under this category must be labeled egg pasta. Fresh and stabilized pastas (paste alimentari fresche e stabilizzate) – Includes fresh and stabilized pastas, which may be made with soft-wheat flour without restriction on the amount. Prepackaged fresh pasta must have a water content not less than 24%, must be stored refrigerated at a temperature of not more than 4 °C (with a 2 °C tolerance), must have undergone a heat treatment at least equivalent to pasteurisation, and must be sold within 5 days of the date of manufacture. Stabilized pasta has a lower allowed water content of 20%, and is manufactured using a process and heat treatment that allows it to be transported and stored at ambient temperatures. The Italian regulations under Presidential Decree N° 187 apply only to the commercial manufacturing of pastas both made and sold within Italy. They are not applicable either to pasta made for export from Italy or to pastas imported into Italy from other countries. They also do not apply to pastas made in restaurants. Macaroni products – defined as the class of food prepared by drying formed units of dough made from semolina, durum flour, farina, flour, or any combination of those ingredients with water. Within this category various optional ingredients may also be used within specified ranges, including egg white, frozen egg white or dried egg white alone or in any combination; disodium phosphate; onions, celery, garlic or bay leaf, alone or in any combination; salt; gum gluten; and concentrated glyceryl monostearate. Specific dimensions are given for the shapes named macaroni, spaghetti and vermicelli. Enriched macaroni products – largely the same as macaroni products except that each such food must contain thiamin, riboflavin, niacin or niacinamide, folic acid and iron, with specified limits. Additional optional ingredients that may be added include vitamin D, calcium, and defatted wheat germ. The optional ingredients specified may be supplied through the use of dried yeast, dried torula yeast, partly defatted wheat germ, enriched farina, or enriched flour. Enriched macaroni products with fortified protein–similar to enriched macaroni products with the addition of other ingredients to meet specific protein requirements. Edible protein sources that may be used include food grade flours or meals from nonwheat cereals or oilseeds. Products in this category must include specified amounts of thiamin, riboflavin, niacin or niacinamide and iron, but not folic acid. The products in this category may also optionally contain up to 625 milligrams of calcium. Milk macaroni products – the same as macaroni products except that milk or a specified milk product is used as the sole moistening ingredient in preparing the dough. Other than milk, allowed milk products include concentrated milk, evaporated milk, dried milk, and a mixture of butter with skim, concentrated skim, evaporated skim, or nonfat dry milk, in any combination, with the limitation on the amount of milk solids relative to amount of milk fat. Nonfat milk macaroni products – the same as macaroni products except that nonfat dry milk or concentrated skim milk is used in preparing the dough. The finished macaroni product must contain between 12% and 25% milk solids-not-fat. Carageenan or carageenan salts may be added in specified amounts. The use of egg whites, disodium phosphate and gum gluten optionally allowed for macaroni products is not permitted for this category. Enriched nonfat milk macaroni products – similar to nonfat milk macaroni products with added requirements that products in this category contain thiamin, riboflavin, niacin or niacinamide, folic acid and iron, all within specified ranges. Vegetable macaroni products – macaroni products except that tomato (of any red variety), artichoke, beet, carrot, parsley or spinach is added in a quantity such that the solids of the added component are at least 3% by weight of the finished macaroni product. The vegetable additions may be in the form of fresh, canned, dried or a puree or paste. The addition of either the various forms of egg whites or disodium phosphate allowed for macaroni products is not permitted in this category. Enriched vegetable macaroni products – the same as vegetable macaroni products with the added requirement for nutrient content specified for enriched macaroni products. Whole wheat macaroni products – similar to macaroni products except that only whole wheat flour or whole wheat durum flour, or both, may be used as the wheat ingredient. Further the addition of the various forms of egg whites, disodium phosphate and gum gluten are not permitted. Wheat and soy macaroni products – begins as macaroni products with the addition of at least 12.5% of soy flour as a fraction of the total soy and wheat flour used. The addition the various forms of egg whites and disodium phosphate are not permitted. Gum gluten may be added with a limitation that the total protein content derived from the combination of the flours and added gluten not exceed 13%. Noodle products – the class of food that is prepared by drying units of dough made from semolina, durum flour, farina, flour, alone or in any combination with liquid eggs, frozen eggs, dried eggs, egg yolks, frozen yolks, dried yolks, alone or in any combination, with or without water. Optional ingredients that may be added in allowed amounts are onions, celery, garlic, and bay leaf; salt; gum gluten; and concentrated glyceryl monostearate. Enriched noodle products – similar to noodle products with the addition of specific requirements for amounts of thiamin, riboflavin, niacin or niacinamide, folic acid and iron, each within specified ranges. Additionally products in this category may optionally contain added vitamin D, calcium or defatted wheat germ, each within specified limits. Vegetable noodle products – the same as noodle products with the addition of tomato (of any red variety), artichoke, beet, carrot, parsley, or spinach in an amount that is at least 3% of the finished product weight. The vegetable component may be added as fresh, canned, dried, or in the form of a puree or paste. Enriched vegetable noodle products – the same as vegetable noodle products excluding carrot, with the specified nutrient requirements for enriched noodle products. Wheat and soy noodle products – similar to noodle products except that soy flour is added in a quantity not less than 12.5% of the combined weight of the wheat and soy ingredients. It is important to note that the federal regulations under 21 CFR Part 139 are standards for the products noted, not mandates. Following the FDA’s standards, a number of states have, at various times, enacted their own statutes that serve as mandates for various forms of macaroni and noodle products that may be produced or sold within their borders. Many of these specifically require that the products sold within those states be of the enriched form. According to a report released by the Connecticut Office of Legislative Research, when Connecticut’s law was adopted in 1972 that mandated certain grain products, including macaroni products, sold within the state to be enriched it joined 38 to 40 other states in adopting the federal standards as mandates. Beyond the FDA’s standards and state statutes, the United States Department of Agriculture (USDA), which regulates federal school nutrition programs, broadly requires grain and bread products served under these programs either be enriched or whole grain (see 7 CFR 210.10 (k) (5)). This includes macaroni and noodle products that are served as part the category grains/breads requirements within those programs. The USDA also allows that enriched macaroni products fortified with protein may be used and counted to meet either a grains/breads or meat/alternative meat requirement, but not as both components within the same meal. ^ Laleg K, Cassan D, Barron C, Prabhasankar P, Micard V (2016). "Structural, Culinary, Nutritional and Anti-Nutritional Properties of High Protein, Gluten Free, 100% Legume Pasta". PLoS One. 11 (9): e0160721. doi:10.1371/journal.pone.0160721. PMC 5014310. PMID 27603917. ^ "Retrieved 21 March 2012". Italianfood.about.com. 10 April 2012. Retrieved 30 July 2012. ^ Pasta. UK: Parragon Publishing. 2005. pp. 6–57. ISBN 978-1405425162. ^ Serventi & Sabban 2002, pp. 24. ^ a b c d e Serventi & Sabban 2002, pp. 15–16. ^ Serventi & Sabban 2002, pp. 10. ^ a b Serventi & Sabban 2002, pp. 17. ^ Serventi & Sabban 2002, pp. 29. ^ "A medical text in Arabic written by a Jewish doctor living in Tunisia in the early 900s", according to Dickie, John (2008). Delizia! The Epic History of Italians and Their Food. New York: Simon and Schuster. pp. 21 ff. ISBN 978-1416554004. ^ The Sicilian coast east of Palermo is being described. ^ Quoted in Dickie, p. 21. ^ "Who "invented" pasta?". 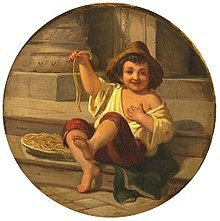 National Pasta Association: "The story that it was Marco Polo who imported noodles to Italy and thereby gave birth to the country's pasta culture is the most pervasive myth in the history of Italian food." (Dickie, p. 48). ^ Serventi & Sabban 2002. ^ Jeffrey Steingarten (1998). The Man Who Ate Everything. Knopf Doubleday Publishing Group. p. 260. ISBN 978-0-375-70202-0. ^ "Food-Info.net> History of Italian-type pasta". www.food-info.net. Retrieved 13 June 2017. ^ a b Walker, Margaret E. "The History of Pasta". inmamaskitchen. Archived from the original on 31 March 2012. Retrieved 24 March 2012. ^ Demetri, Justin. "History of pasta". lifeinitaly. Retrieved 24 March 2012. ^ Faccioli, Emilio (1987). L'Arte della cucina in Italia (in Italian). Milan: Einaudi. p. 756. The culí di pomodoro recipe is in the chapter devoted to Leonardi. ^ a b c d "History of pasta". nternational Pasta Organisation. 2018. Retrieved 18 November 2018. ^ "The History of Pasta: It's not what you think!". Pasta Recipes by Italians. Retrieved 26 March 2012. ^ Justin Demetri (10 May 2018). "History of pasta". Life in Italy. Retrieved 18 November 2018. ^ "Radio Praha - THE OLDEST CZECH PASTA PLANT RELIES ON TRADITIONAL TASTE OF ITS CUSTOMERS (visited - 2019. Jan. 3.)". ^ "The History of Pasta in the Italian Kitchen". Archived from the original on 24 August 2011. Retrieved 26 March 2012. ^ a b Demetri, Justin. "History of Pasta". Retrieved 29 March 2012. ^ Tracey, Michael. "The Origin and History of Pasta where Pasta comes from". Retrieved 28 March 2012. ^ Vriezinga SL, Schweizer JJ, Koning F, Mearin ML (September 2015). "Coeliac disease and gluten-related disorders in childhood". Nat Rev Gastroenterol Hepatol (Review). 12 (9): 527–36. doi:10.1038/nrgastro.2015.98. PMID 26100369. Gluten-related disorders such as coeliac disease, wheat allergy and noncoeliac gluten sensitivity are increasingly being diagnosed in children. (...) These three gluten-related disorders are treated with a gluten-free diet. ^ Ferreira SM, de Mello AP, de Caldas Rosa dos Anjos M, Krüger CC, Azoubel PM, de Oliveira Alves MA (15 January 2016). "Utilization of sorghum, rice, corn flours with potato starch for the preparation of gluten-free pasta". Food Chem. 191: 147–51. doi:10.1016/j.foodchem.2015.04.085. PMID 26258714. ^ Padalino L, Mastromatteo M, Lecce L, Spinelli S, Conte A, Del Nobile MA (March 2015). "Optimization and characterization of gluten-free spaghetti enriched with chickpea flour". Int J Food Sci Nutr. 66 (2): 148–58. doi:10.3109/09637486.2014.959897. PMID 25519246. ^ Li, Man; Zhu, Ke-Xue; Guo, Xiao-Na; Brijs, Kristof; Zhou, Hui-Ming (1 July 2014). "Natural Additives in Wheat-Based Pasta and Noodle Products: Opportunities for Enhanced Nutritional and Functional Properties". Comprehensive Reviews in Food Science and Food Safety. 13 (4): 347–357. doi:10.1111/1541-4337.12066. ISSN 1541-4337. ^ a b c Quessenberry, Sara. "Dried Vs. Fresh Pasta". Real Simple. Retrieved 28 March 2012. ^ a b Christensen, Emma. "Dry Pasta vs. Fresh Pasta: What's the Difference?". The Kitchn. Retrieved 28 March 2012. ^ a b Laux, Sandra. 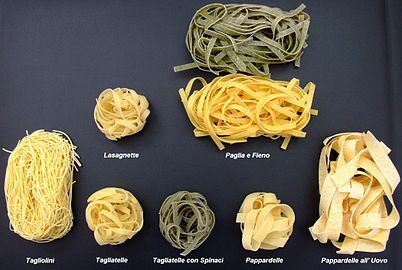 "Types of Pasta". Mangia Bene Pasta. Retrieved 28 March 2012. ^ Montany, Gail (19 June 2011). "Lidia Bastianich on the quintessential Italian meal". The Aspen Business Journal. Archived from the original on 30 January 2012. Retrieved 1 January 2012. ^ Bastianich, Lidia; Tania, Manuali. Lidia Cooks from the Heart of Italy: A Feast of 175 Regional Recipes (1st ed.). ^ Bastianich, Lidia; John, Mariani. How Italian Food Conquered the World (1st ed.). ^ "How to Make Pasta Dough". allrecipes. Retrieved 24 March 2012. ^ "Fresh Pasta". allrecipes. Retrieved 24 March 2012. ^ a b Sicignano, Angelo; Di Monaco, Rossella; Masi, Paolo; Cavella, Silvana (2015). "From raw material to dish: Pasta quality step by step". Journal of the Science of Food and Agriculture. 95 (13): 2579–2587. doi:10.1002/jsfa.7176. PMID 25783568. ^ a b c d e "The complexities of durum milling". world-grain.com. Sosland Publishing Co. 2 July 2014. ^ a b Sissons, M (2008). "Role of durum wheat composition on the quality of pasta and bread". Food. 2 (2): 75–90. ^ "How pasta is made". made how. Retrieved 27 March 2012. ^ a b Gao, Yupeng; Janes, Marlene E; Chaiya, Busarawan; Brennan, Margaret A; Brennan, Charles S; Prinyawiwatkul, Witoon (2018). "Gluten-free bakery and pasta products: Prevalence and quality improvement". International Journal of Food Science & Technology. 53 (1): 19–32. doi:10.1111/ijfs.13505. ^ Padalino, Lucia; Conte, Amalia; Del Nobile, Matteo Alessandro (9 December 2016). "Overview on the General Approaches to Improve Gluten-Free Pasta and Bread". Foods. 5 (4): 87. doi:10.3390/foods5040087. ISSN 2304-8158. PMC 5302439. PMID 28231182. ^ Recipe Tips. "Pasta Handling, Safety & Storage". Retrieved 27 March 2012. ^ a b Roos, Yrjö H (2010). "Glass Transition Temperature and its Relevance in Food Processing". Annual Review of Food Science and Technology. 1: 469–496. doi:10.1146/annurev.food.102308.124139. PMID 22129345. ^ Takhar, Pawan Singh; Kulkarni, Manish V; Huber, Kerry (2006). "Dynamic Viscoelastic Properties of Pasta As a Function of Temperature and Water Content". Journal of Texture Studies. 37 (6): 696–710. doi:10.1111/j.1745-4603.2006.00079.x. ^ a b c d Shewry, P. R; Halford, N. G; Belton, P. S; Tatham, A. S (2002). "The structure and properties of gluten: An elastic protein from wheat grain". Philosophical Transactions of the Royal Society B: Biological Sciences. 357 (1418): 133–142. doi:10.1098/rstb.2001.1024. PMC 1692935. PMID 11911770. ^ Kill, R. C.; Turnbull, K (2001). "Pasta and semolina technology". ^ De Noni, Ivano; Pagani, Maria A (2010). "Cooking Properties and Heat Damage of Dried Pasta as Influenced by Raw Material Characteristics and Processing Conditions". Critical Reviews in Food Science and Nutrition. 50 (5): 465–472. doi:10.1080/10408390802437154. PMID 20373190. ^ a b c d Petitot, Maud; Abecassis, Joël; Micard, Valérie (2009). "Structuring of pasta components during processing: Impact on starch and protein digestibility and allergenicity". Trends in Food Science & Technology. 20 (11–12): 521–532. doi:10.1016/j.tifs.2009.06.005. ^ "World Pasta Production". International Pasta Organisation. Archived from the original on 5 September 2012. ^ a b "The World Pasta Industry in Figures: World pasta production in 2016" (PDF). International Pasta Organization. 2016. Retrieved 7 June 2018. ^ "Pasta for all. Worldwide sales continue to grow". Food Business. 29 May 2018. Retrieved 7 June 2018. ^ a b "Consumer Trends: Pasta Market in the EU27" (PDF). International Markets Bureau, Agriculture and Agri-Food Canada. April 2010. Archived from the original (PDF) on 30 October 2012. Retrieved 30 June 2012. ^ a b "Pasta". The Observatory of Economic Complexity. 2016. Retrieved 7 June 2018. ^ Publishing, Harvard Health. "Glycemic index for 60+ foods - Harvard Health". Harvard Health. Retrieved 11 September 2018. ^ "Pasta". eNotes. Retrieved 27 March 2012. ^ Explore the world of Canto-Western cuisine. Associated Press via MSNBC (8 January 2007). Retrieved on 19 September 2013. ^ "Rules for the Review of Legislation on Production of Flour and Pasta". Italian Government Printing Office. Retrieved 7 July 2012. ^ "Rules for the Review of Legislation on Production of Flour and Pasta (English Translation)" (PDF). Union of Organisations of Manufacturers of Pasta Products to the EU. Retrieved 7 July 2012. ^ "Food, Drug, and Cosmetic Act, Title 21, Chapter 9, S. IV, Sec. 341" (PDF). Retrieved 7 July 2012. ^ "U.S. Code of Federal Regulation, Title 21 Part 139". Archived from the original on 8 June 2010. Retrieved 7 July 2012. ^ "State of Connecticut General Provisions, Chapter 417, Sections 21a-28 (Pure Foods and Drugs)". Archived from the original on 11 August 2012. Retrieved 7 July 2012. ^ "State of Florida Statutes, Chapter 500.301–500.306 (Food Products)". Retrieved 7 July 2012. ^ "Utah Administrative Codes – Rule R70-620. Enrichment of Flour and Cereal Products". Archived from the original on 19 December 2012. Retrieved 7 July 2012. ^ "Oregon Revised Statues § 616.785 Sale of unenriched flours, macaroni or noodle products prohibited". Retrieved 7 July 2012. ^ Duffy, Daniel. "Legislative History of Statute Concerning the Regulation of Grain Product". Connecticut General Assembly. Retrieved 7 July 2012. ^ "U.S. Code of Federal Regulation, Title 7, Part 210 – National School Lunch Program". GPO. Archived from the original on 7 July 2012. Retrieved 7 July 2012. ^ "U.S. Code of Federal Regulation, Title 7, Part 220 – National School Breakfast Program". GPO. Archived from the original on 7 July 2012. Retrieved 7 July 2012. ^ "USDA Buying Guide for Child Nutrition Programs – Grains and Bread" (PDF). United States Department of Agriculture. Archived from the original (PDF) on 13 May 2013. Retrieved 7 July 2012. Look up pasta in Wiktionary, the free dictionary.